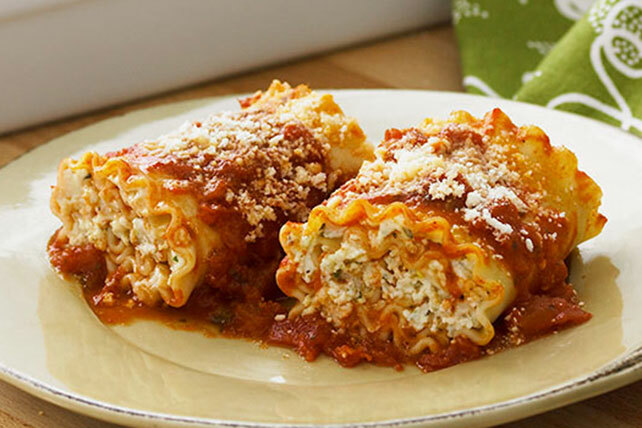 In this awesome riff on traditional lasagna, ricotta, Parmesan and a blend of three cheeses are rolled up in the pasta and baked until delicious. Spread 1/2 cup pasta sauce onto bottom of 13x9-inch baking dish sprayed with cooking spray. Spread each noodle with 3 Tbsp. cheese mixture; roll up. Place, seam sides down, in prepared dish. Top with remaining pasta sauce and Parmesan; cover. Bake 40 to 50 min. or until heated through, uncovering for the last 10 min. Prepare using POLLY-O Natural Part Skim Ricotta Cheese. Assemble recipe as directed; cover with foil. Refrigerate up to 24 hours. When ready to serve, bake, covered, 1 hour 5 min. or until heated through, uncovering for the last 10 min. Or, assemble lasagna, wrap tightly with foil and freeze up to 1 month. When ready to serve, thaw overnight in refrigerator, then bake, covered, 1 hour 5 min. or until heated through, uncovering for the last 10 min. Assemble roll-ups as directed; place half in each of 2 (9-inch) square baking dishes. Bake one as directed and freeze the other for later enjoyment. Wrap second lasagna tightly with foil, then freeze up to 1 month. When ready to serve, thaw overnight in refrigerator, then bake, covered, 1 hour 5 min. or until heated through, uncovering for the last 10 min.